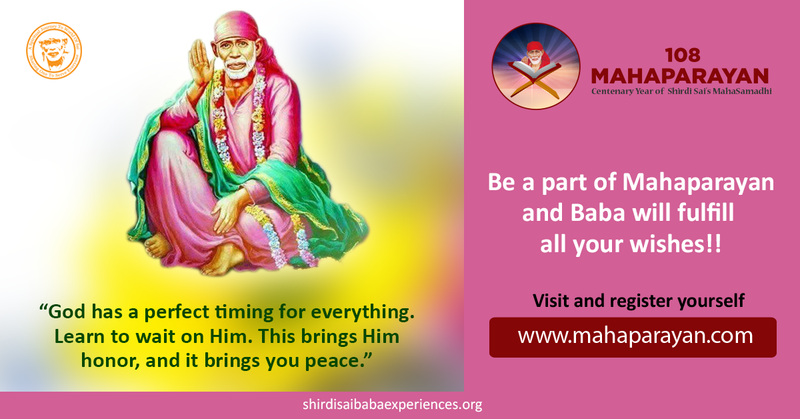 Shirdi Sai Baba devotee Shobana Prathap from India says: I am really grateful to be a part of this Mahaparayan and now in Mahajaap, thank you Pooja mam and all the good souls behind this divine job . May Baba bless you abundantly. I really got dumbstruck by your intelligent manner in arranging the groups. Now let me come to the miracle by my beloved daddy Sai Baba . I'm His sparrow right from 2011. I pray to Him and offer puja every Thursday. Today (15/2/2018) I made preparations early morning for puja. I decorated Baba with flowers like Jasmine and red Roses and lighted ghee diya before Him. My allotted chapter for the day was 45 and 46. I usually read 108 Sai Namavali by putting flowers on Baba and after which I started reading the Mahaparayan chapters. I had a thought running in my mind right from starting the pooja that a flower should fall off itself from Baba’s picture as I heard a women telling about Baba miracles on a tv channel. I expected and asked Baba despondently please show Your blessings by a fall of a flower from the picture and I started staring for a moment all the pictures of Baba for few minutes and thought all the flowers are tightly fixed and hence there was no way that it would fall. However after few minutes I started reading the 45th chapter it was about the devotion of nav nathas and in the last paragraph there was a saying from Baba's mouth that " There are innumerable saints in the world but our father is our father, others might say many good things, but we should never forget our Guru’s words. In short love your Guru wholeheartedly, surrender to Him completely and prostrate yourselves before Him reverentially". At this I looked at my Baba and told I am very depressed and I am in a critical situation in my life and You know all that Baba. I will feel happy if I know that You hear all my prayers. Please give me that happiness ( my eyes looking for His presence by a fall of flower ) as I thought and turned my head to read again the book, in a fraction of second a red rose from Baba's picture fell off. I was awestruck and I had goosebumps and my eyes got wet. Oh God I never experienced such a thing in my life. I thanked Him and my joy knew no bounds. Love You Baba. I got so much confidence that my Baba is hearing me and loving and caring me. I have no worry about my life any more. Whatever He fixes for me it's for my good, love You Baba. I wanted to share this on this blog . Thank You so much if it gets posted here . When we are sinking in sorrow and we pray earnestly then to rise our faith and tell us that He is there for us always no matter what; Baba can make the flowers fall for the sake of His children for He loves us more than our earthly parents and guardians. None can equal Your love and grace Deva. Love You loads. Jai Ho Sai!